Coach Mike Mulvey has been brutally sacked by Central Coast Mariners following their humiliating 8-2 A-League defeat to Wellington Phoenix last night. The Phoenix have surged into the A-League's top four with their biggest victory, hammering the hapless Mariners in Gosford. The scoreline equalled the competition's biggest scoring match when the Mariners crashed to an 8-2 home loss against Newcastle Jets just 11 months ago. Mulvey joined the Mariners ahead of the 2018/19 season but with just one win, the club has decided to act. The result, albeit against a dreadful home side, puts the Phoenix in a great position to play finals football for the first time since 2014-15. They are ahead of fifth-placed Adelaide United on goal difference, with Melbourne City a point further back. Crucially, Wellington are now five points clear of the seventh-placed Newcastle Jets and play all five of the sides directly below them in their six-game regular season run-in. The Phoenix had never won an away game by more than three goals until last night and the match also tied the A-League record for most goals. The victory equalled the club's biggest of 6-0 against Gold Coast in Wellington in 2009. The game was over as a contest midway through the first half, with the Phoenix scoring three in the first 21 minutes. After a bright Mariners start, defender Sam Graham diverted a Roy Krishna cross into his own net in the eighth minute before the Fijian doubled the advantage soon after, cleverly lobbing keeper Ben Kennedy after seizing upon a long clearance. Graham was also culpable for the third, coughing up possession on halfway, allowing Sarpreet Singh to break free and play in David Williams, who finished with aplomb. It was to get even better for Wellington in first half stoppage time when Max Burgess, enjoying just a second start of the season, threaded a delightful ball into the path of a rampaging Krishna, who beat Kennedy to the ball, cut back past two retreating defenders and buried a clinical finish into the top corner. It was his 14th goal of the season, making it the most prolific of his A-League career and taking him joint top of the competition's Golden Boot standings. Four-nil at halftime and the Phoenix were in dreamland. It took just five minutes after the break for the score to inflate further, with Krishna involved again. His run and cross was cleverly dummied by Williams, allowing Liberato Cacace to score his first A-League goal with a tidy right-foot finish. He was joined on the scoresheet by Singh soon after when he drove through a paper-thin Mariners defence to guide home a sixth before Louis Fenton joined the party, steering in a scarcely believable third goal in eight minutes to make it 7-0. With half an hour still to play, double figures looked possible - and despite a prolific night, the Phoenix missed several other good chances - but instead Jack Clisby and Stephen Mallon scored eye-catching consolation goals for the Mariners. That noticeably infuriated Phoenix coach Mark Rudan, who handed debuts to teenagers Callan Elliot and Gianni Stensness off the bench, before Singh rounded out the scoring from close range in the dying minutes. 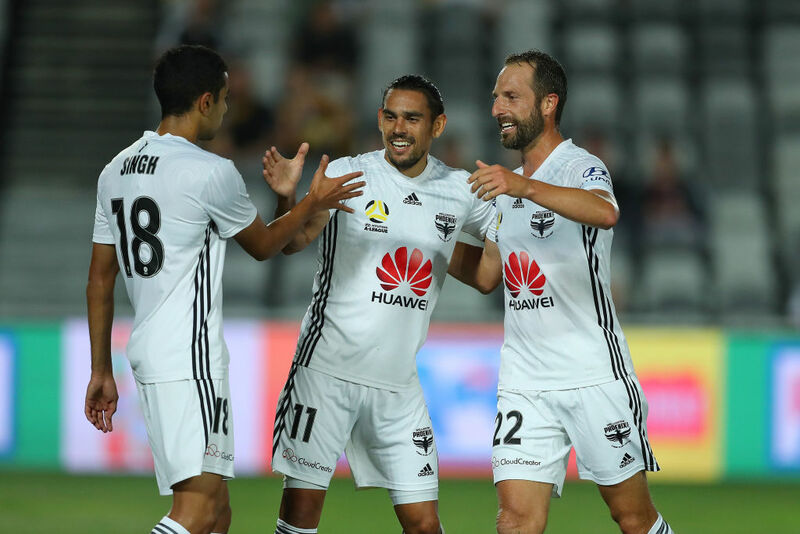 The Phoenix play the eighth-placed Western Sydney Wanderers at Westpac Stadium next Sunday, returning home full of confidence for their first game in Wellington for 50 days. That break will be slightly longer for Singh who picked up a fifth booking of the season, earning a one-match suspension. A club statement released early on Sunday said: "The Central Coast Mariners can today advise that the Club has parted ways with Head Coach Mike Mulvey, effective immediately. "With six games remaining in the Hyundai A-League 2018/19 season, the club will issue a statement when a decision has been made regarding who will lead the team during this period. "At this stage, there are no other changes to the club's other coaching and football support staff. The Central Coast Mariners wish Mulvey all the best in his future endeavours and him for his service to the Club." Central Coast Mariners 2 (J. Clisby 61, S. Mallon 69), Wellington Phoenix 8 (Own goal 8, R. Krishna 12, 45+1, D. Williams 21, L. Cacace 51, S. Singh 57, 88, L. Fenton 59).